In this lesson, you will get to learn another Japanese expression - ようです (you desu). Some people may mixed up this expression with そうです (sou desu), or 目の"そう" (me no "sou"), which you have learned in lesson 19. However, they are two different expressions. 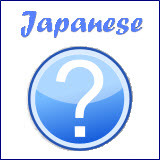 When the look of a thing leads you to make a guess, you state your guess using 目の"そう" (me no "sou"). You make the guess after looking at the appearance of a thing although it has not confirmed for a fact. Japanese expression ようです (you desu) conveys the speaker's subjective conjecture, which is based on the information obtained through his or her sensory organs. The difference between these two expressions will be explained further using some examples. Meaning: There is a big crowd at the cross junction. It looks like there's an accident. Based on the big crowd that you saw at the cross junction, you deduced that there's been an accident. Meaning: I have a cough and a headache. It seems like I have caught a cold. Meaning: The street is wet. It seems like it has rained. Meaning: Alan has been studying for a long time. It seems like he has a lot of homework. Meaning: That restaurant is always so crowded. It seems like the food there is delicious. Meaning: The office light is off. It looks like no one is there. Meaning: Ms Tanaka doesn't eat fish. It looks like she doesn't like fish. Meaning: The clock is not moving since this morning. It seems like it's out of order. Meaning: Mr Yamada went to the hospital. It looks like he is sick. It's common that people get confused between そうです (sou desu) and ようです (you desu). 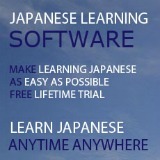 Let's use an example to differentiate this two Japanese expressions. Meaning: Teacher is rushing around wherever he goes. He seems to be busy. Meaning: Teacher is not in the office. But his desk is piled with many documents. It seems that he is busy. In example 1, it indicates an intuitive judgement based on what you have seen of your teacher's condition or behaviour. In example 2, it indicates your judgement based on what you have seen, read, heard or been told about your teacher. The important distinction is not the sense which is being used, but rather that the former is based on direct observation and the latter is based on inference. Meaning: This hotel is similar to pyramid. Meaning: That person's hair is similar to that of a lion. Again, it's not easy to describe a person's hair. But if you say it looks similar to that of a lion, immediately people can imagine the image of that person's hair and understand your description. Meaning: This hat is similar to that of the Santa Claus. Meaning: The baby's cheek looks like an apple. Meaning: Mr Yamada's hair color is similar to the color of a tomato. Meaning: This hotel has got the shape of the pyramid. Meaning: That boy is wearing a hat which is similar to that of the Santa Claus. Meaning: That person has hair which is similar to that of a lion. Meaning: The baby has apple-like cheeks. Meaning: Mr Yamada's hair has the color similar to that of a tomato. 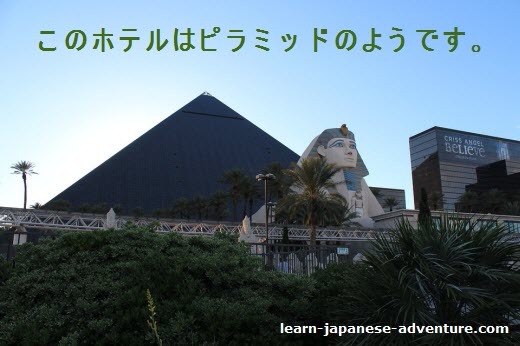 When you want to describe somebody's action or describe the adjective, use this Japanese expression Noun のように Verb/Adjective (Noun no you ni Verb/Adjective). Meaning: That man swims like a fish. You can describe in many ways how good or how fast the man can swim. But the best way to describe is he swims like a fish. People will then know how good he is at swimming. Similarly, you can describe in many ways how cold the water is. But the best way to describe is that the coldness is similar to that of the ice. Then people can get the idea of how cold it is. Meaning: This water is as cold as ice. Meaning: This classroom is as quiet as the library. Meaning: I want to speak Japanese as well as the native Japanese. Meaning: My younger brother can climb the tree skillfully, just like a monkey. Meaning: I want to fly in the sky like the bird. 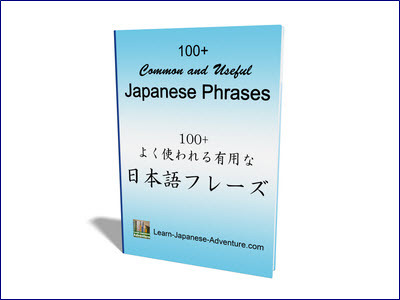 Lesson 19: Japanese Expression sou desu (そうです), or 目の"そう" (me no "sou").